Description: OpenSS7 Hardware Selection V400P. These cards are no longer supplied. It may be possible to obtain used or surplus cards on computer auction websites. If you have one of these cards that was previously used with Asterisk, Yate or FreeSwitch you can repurpose them for use with OpenSS7. When purchasing cards, seriously consider the newer C400P/E cards. 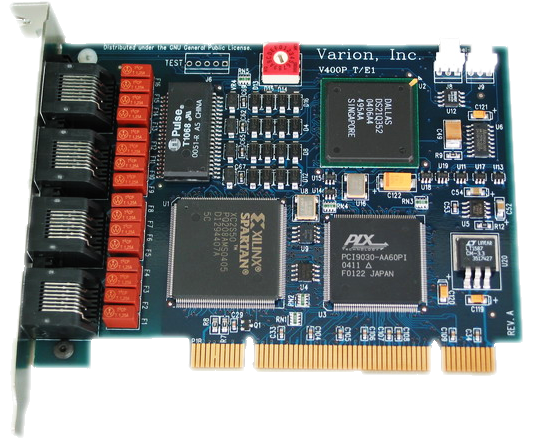 The T400P and E400P cards are 4-span T1 or E1 cards manufactured by Varion. These cards were previously manufactured by Digium. The figure below shows a picture of a T400P card. The T400P and E400P cards have a lower level of signalling performance due to the lack of on-board HDLC functions. Transfers to the host processor over the PCI bus use PCI I/O ports and memory mapping. These cards are supported by the X400 driver. The function of the T/E400P Channel driver is to provide for the termination of 2.048Mbps, 1.544Mbps, 64kbps and 56kbps digital paths. This driver provides direct access to the channelized or unchannelized T1 or E1 digital paths to OpenSS7 media and signalling protocol modules as well as providing T1 or E1 management, framing, coding, alarms, and synchronization. 4 T1 or E1 spans per card. PLX PCI 9030 PCI bus chip. Raw transfer of octets from framers to PCI bus. Uses OpenSS7 Soft-HDLC engine for SS7, ISDN and ISO. 124 channels per card (E400P). Released by Jim Dixon under the GNU Public License. Open Hardware design: schematics, artwork and Gerber plots available. Supports a number of Open Source drivers. Cannot TDM switch on card or between cards, media channels must be transferred through host to switch between cards. I/O Port and Memory Map instead of PCI DMA bus-mastering and burst transfers. Does not run on high speed buses. No integrated Ethernet for SIGTRAN and VoIP applications. Synchronization per-card instead of per-system. Ultimately, the performance limiting factor of the T400P and E400P cards is the bandwidth of the PCI bus and the ability of the processor to perform Soft-HDLC and TDM switching in software. A 350MHz processor is capable of processing the bandwidth of an entire E400P card (124 signalling links) with a combined link throughput of 8.192 Mbps. For the OpenSS7 VoIP Switch, this performance is more than adequate. A medium grade 2GHz PC should be capable of handling 2 cards (248 SS7 links) with adequate excess capacity available for background operations. These cards are very cost-effective and can provide 64kbps SS7 links at average incremental interface cost of approximately $4.00 USD per signalling link.